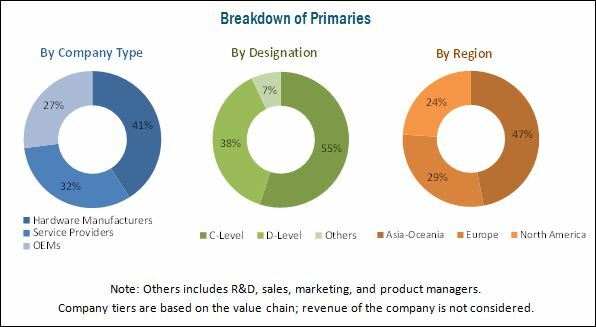 [219 Pages Report] The telematics solutions market for on & off-highway vehicles is projected to grow at a CAGR of 14.37% from 2017 to 2022, to reach a market size of USD 40.84 Billion by 2022 from USD 17.78 Billion in 2016. The base year considered for the study is 2016 and the forecast period is 2017 to 2022. The growing number of regulatory mandates for vehicle safety and security is driving the growth of the telematics solutions market. The regulations that are projected to influence the telematics solutions market include automatic crash notification, eCall, remote diagnostics, on-road assistance, and vehicle tracking. Alternatively, the increasing consumer demand is projected to drive the market for services such as infotainment and navigation. 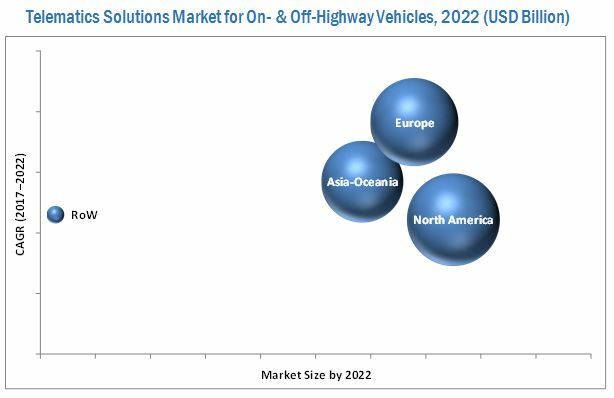 The off-highway telematics solutions market is projected to be driven by the increase in demand for fleet management services such as fuel management, maintenance, and location tracking among others. The bottom-up approach is used to estimate and forecast the on-highway telematics solutions market, by hardware. To determine the market size, by volume, the country-level numbers of each vehicle type (PC, LCV, and HCV) have been multiplied by the country-level penetration of each component (derived from model mapping at country level) on each vehicle type. The country-level market, by volume, of each vehicle type is added to derive the regional-level market and further to get the telematics hardware market, by region. The regional level market is then multiplied with the regional-level AOP of the component by each vehicle type that results in the regional-level market. The further summation of regional-level markets gives the telematics solutions market, by hardware (display units and TCU), by value. A similar approach has been followed to derive the telematics solutions market for off-highway vehicles, by equipment type (construction and agriculture tractors) and hardware. The top-down approach has been used to estimate and validate the size of the telematics solutions market for on-highway vehicles, by services. The market size, by value, of the telematics services market has been derived by identifying the value of different services offered in the automotive industry globally. The regional-level penetrations of each service have been confirmed through primary and secondary sources, leading to the regional- and country-level market for telematics, by services (automatic crash notification, emergency calling, infotainment & navigation, on-road assistance, remote diagnostics, and vehicle tracking/recovery). A similar approach has been followed to derive telematics solutions market for on-highway vehicles, by connectivity type (embedded, tethered & integrated) and aftermarket (PC, LCV & HCV), for off-highway vehicles, by services (fuel management, location/ usage tracking, maintenance and repair scheduling, navigation, diagnostics & others), and technology (cellular & satellite) in terms of volume and value. The research methodology involves various secondary sources such as Organisation Internationale des Constructeurs d’Automobiles (OICA), European Automobile Manufacturers Association (ACEA), Canada Automobile Association (CAA), Connected Vehicle Trade Association (CVTA), Auto Care Association, Committee for European Construction Equipment (CECE), Verband Deutscher Maschinen- und Anlagenbau e.V. (VDMA), CEMA aisbl - European Agricultural Machinery, corporate filings (such as annual reports, investor presentations, and financial statements), and business and industry magazines along with paid databases. The telematics solutions market for on & off-highway vehicles is dominated by a few globally established players such as Robert Bosch GmbH (Germany), Continental AG (Germany), LG Electronics (South Korea), Verizon (U.S.), Harman International (U.S.), and Qualcomm Technologies, Inc. (U.S.). The telematics solutions market for on- & off-highway vehicles is projected to grow at a CAGR of 14.37% during the forecast period, to reach USD 40.84 Billion by 2022. Upcoming regulations on vehicle and passenger safety are expected to drive the growth of the telematics solutions market. Other factors such as the increased sales of mid and premium segment vehicles, growing inclination toward entertainment services, technological developments in 5G technology and semi-autonomous/autonomous vehicles, and rising demand for diagnostic data to improve vehicle performance have driven the growth of the telematics solutions market for on- & off-highway vehicles. Infotainment and navigation is estimated to have the largest share of the telematics solutions market for on-highway vehicles. The growth of this segment is driven by rising consumer demand and increasing adoption by automotive OEMs. Also, the improvements in processing capabilities of the telematics control unit (TCU) have led to the inclusion of features such as interactive voice-based command interface for accessing in-vehicle features. With the rising number of developments in the field of semi-autonomous vehicles, premium car manufacturers are offering advanced driver safety features along with 3D navigation services. In addition, most of the new passenger cars offer a free trial for infotainment services. However, the renewal of subscription plan is required once the free trial period is over. Continuous infrastructural developments and the rising demand for traffic and routing information are also expected to drive the telematics solutions market for infotainment and navigation services. The embedded form factor dominates the telematics solutions market and is expected to remain the largest and fastest growing segment during the review period. This can be attributed to passenger safety, improved user experience, and vehicular data privacy. In 2016, the European Union (EU) adopted the General Data Protection Act. The European Automobile Manufacturers’ Association (ACEA) has lauded this move by the EU as it helps to address problems related to data security and accessibility of vehicle information by a third party. Additionally, embedded solutions offer faster and reliable data communication between the vehicle and infrastructure, which reduces the turnaround time and improves process efficiency. All these factors have contributed to the market share of the embedded telematics solutions market for on-highway vehicles. The commercial vehicles segment is estimated to have the largest share of the telematics aftermarket for off-highway vehicles. The growth of this segment can be attributed to the benefits such as driver behavior monitoring, predictive maintenance, high fuel efficiency, and fleet analytics. As per OICA, the global commercial vehicle parc stood at 335.1 million units in 2015. Further, in December 2015, the FMCSA mandated the adoption of Electronic Logging Device (ELD) compliance, which will be completely implemented within two years from the date of publishing. The government of China also mandated the telematics and GPS technology in commercial vehicles. Due to the rise in global vehicle parc and government regulations, vehicles need to meet the updated requisites. This is expected to drive the telematics aftermarket further for this segment. North America is estimated to be the largest telematics solutions market for on-highway vehicles from 2017 to 2022. North America holds the largest market share due to the presence of key OEMs, strategic partnerships, developed infrastructure, and high adoption rate of innovative solutions. On the other hand, the European market is expected to grow at the highest CAGR during the review period. The telematics solutions market is driven by the upcoming eCall regulation for passenger cars. Other factors such as organic and inorganic developments by telematics vendors are expected to lead to a significant upsurge in the commercial vehicle telematics solutions market. The region has seen important acquisition activities in the recent past. For instance, TomTom International BV (Netherlands) acquired Fleetlogic (Netherlands) in December 2014 that helped to expand its portfolio in the European market. Similarly, in 2015, Fleetmatics (U.S.) acquired Ornicar (France) to expand its presence in the French market. All these factors have resulted in the growth of the telematics solutions market in this region. The key factors restraining the growth of the telematics solutions market are a lack of standardization and concerns related to data privacy and security. These factors may affect the growth of the telematics solutions market in the near future. Some of the key players in the telematics solutions market include Robert Bosch GmbH (Germany), Continental AG (Germany), LG Electronics (South Korea), Verizon (U.S.), Harman International (U.S.), and Qualcomm Technologies, Inc. (U.S.). Robert Bosch GmbH adopted new product development and expansion as the key strategies to retain its market position, while Continental AG followed strategies of partnership, expansion, and new product development to remain a prominent player in the market. North America - Canada, Mexico and U.S. Figure 7 Japan: Rising Debt-GDP Ratio to Be the Most Crucial Indicator Given Its Excessively Weak Performance in the Recent Past.